Harman Kardon Aura Studio 2 is unlike any other Bluetooth speaker you can find on the market. Now, you probably already know that Harman Kardon makes stylish, visually appealing speakers but this one is unique and looks better than any other Harman Kardon Bluetooth speaker we’ve reviewed in the past. When it comes to design, it can’t get much better than this. Aura 2 should not be mistaken for similar versions Aura and Aura+ (they support wi-fi, AirPlay, and come with an app) which are more expensive but look pretty much the same. Besides the impressive design, there are a few more great things about Harman Kardon Aura Studio 2. The most interesting feature is the ambient lighting. That’s the first thing you are going to notice when you turn on the speaker. The lights are truly magical. We were impressed by the Bluetooth connection and sound quality, too (balanced sound with a punchy bass). The speaker delivers 360-sound which is another great thing. When it comes to things we didn’t like, you should know that Aura Studio 2 has to be plugged in all the time (no battery) and it’s not portable. Also, it’s mostly made of plastic so you should take good care of this speaker. If you want your Bluetooth speaker to sound great but also to look great, speakers made by Harman Kardon are always a great choice. If you want your speaker to be truly unique, Harman Kardon Aura Studio 2 is, without any doubt, one of the best options you will find. As always, Harman Kardon takes presentation seriously. Your Aura Studio 2 Bluetooth speaker will be nicely packed and protected inside a premium-looking box. Besides the speaker, you will get one power adapter with 4 regional power cables (US included), user manual, and 1-year warranty sheet. 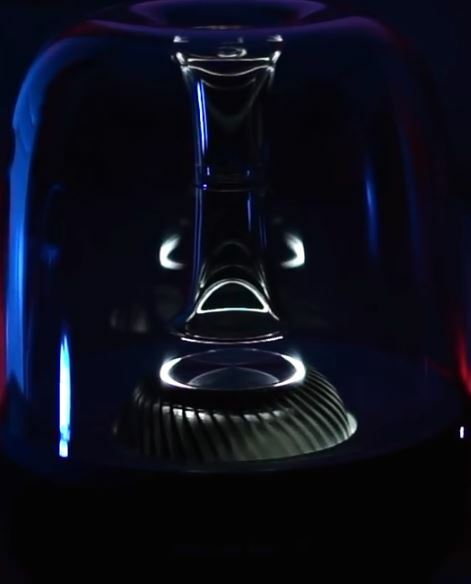 Most of the speakers made by Harman Kardon look elegant but this one is truly amazing. It’s probably the most unique. If you want something with ambient lighting that looks stylish, Aura Studio is the right choice. Aura Studio 2 is not as big and bulky as we have expected. Pictures can be deceiving. 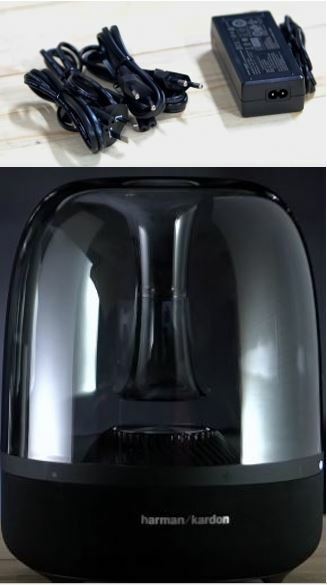 The first thing that makes this speaker stand out is the transparent dome. It looks like it’s made of glass but it’s actually transparent plastic and it doesn’t look very durable. The base of the speaker is made of hard plastic and covered with a nice protective fabric. Inside the dome, there’s an LED ring, lighted turbine, and a tube with a bass reflex port on the top. The speaker features one bass reflex port (for improved bass response). It doesn’t have passive bass radiators like most of today’s portable Bluetooth speakers. This port is located on the top. On the bottom, you will see one large 4.5-inch down-firing woofer and three plastic feet. Control buttons are located along the black (or grayish) rubberized strip between the dome and the base. There are 6 buttons and they are all backlit. You can use these controls to adjust the brightness of the lights, adjust the volume, answer/end calls (speakerphone button can be used to play/pause the music, too), initiate pairing, and power on/off the speaker. 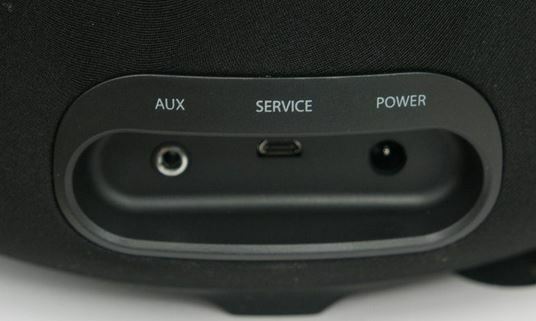 On the rear panel of the speaker, you will find 3 input ports – AUX input (AUX cable is not included), micro USB port (for firmware updates), and DC power input. The first thing you are going to notice when you turn on the speaker are those beautiful ambient lights reflecting around the dome. Harman Kardon claims that your music is going to look better than ever and we couldn’t agree more. The speaker features Bluetooth 4.1 and it supports A2DP (Advanced Audio Distribution Profile), HFP (Hands-Free Profile), and AVRCP (Audio/Video Remote Control Profile). Aptx low latency codec is not supported so you can’t pair wirelessly this speaker to your Bluetooth-enabled TV or phone and watch movies – you will experience noticeable and very annoying sound delay. If you want to connect them to the speaker and watch movies or YouTube videos without sound delay, you will have to use the AUX input and 3.5mm audio cable. You can pair two Aura Studio 2 wireless speakers together and get louder sound (Dual sound feature). 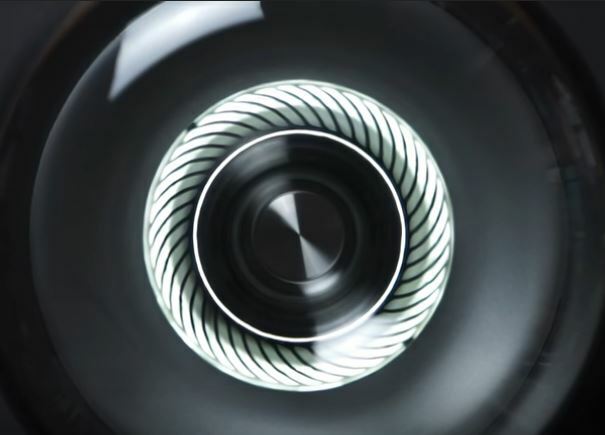 Inside the speaker’s base, there are six 1.5- inch tweeters arranged in a way that enables 360-degree sound dispersion. Inside the base, there’s 4.5-inch down-firing woofer. The plastic tube is positioned right above the woofer and it directs the air pushed by the woofer towards the bass reflex port on the top of the transparent dome. All the control buttons are located on the speaker. You won’t get any remote and there is also no app that you can use to control the playback. We didn’t like the fact that there are no dedicated track buttons. The speaker has a built-in mic so you can use Aura Studio 2 to answer phone calls (speakerphone feature). We have some minor complaints regarding the performance but the overall impression is very good. The Bluetooth streaming works perfectly. Harman Kardon Aura Studio 2 features Bluetooth 4.1. We haven’t experienced any signal loss or any other streaming-related issue within the advertised 33ft. Compatibility is not an issue – the speaker works with both Android and Apple devices. The pairing is quick and simple but there’s no NFC quick pairing feature. In order to pair your phone with the speaker, you have to press the Bluetooth button on the speaker (initiate pairing), find the speaker in the list of available Bluetooth devices, and pair with it. The speaker has no source button or switch and Bluetooth connection is prioritized. So, if you are streaming some music from your phone via Bluetooth and connect some other audio source through the AUX input and try to play some music, the speaker will play the audio that’s being streamed via Bluetooth. In order to play the music via AUX input, you have to pause the Bluetooth connection. If you are playing the music through the AUX input and pair the speaker with your phone, audio that’s being streamed via AUX cable will be paused. The Bluetooth connection always has priority over the AUX connection. The controls are simple and intuitive (you don’t need to read the manual to learn how to use them). All the buttons are very responsive. Pairing two speakers together can be tricky but it’s actually very simple. If you want to pair two Aura Studio 2 speakers and get a louder sound, you should turn on both speakers, press and hold the Bluetooth button on the first speaker for more than 5s, and then press and hold the same button on the other speaker. There is no stereo mode – the speakers will play the same audio output. We didn’t want to talk about that ambient lighting again but we couldn’t resist since there is one really interesting detail. 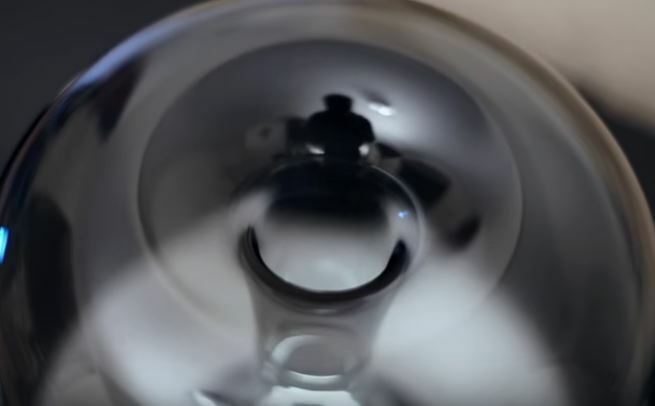 That LED ring inside the dome gets brighter when you turn up the volume and gives you the info about the sound volume. Aura Studio 2 sounds amazing. 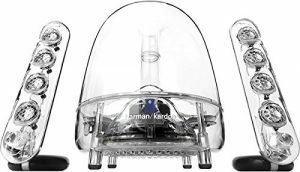 This speaker, just like many other Harman Kardon speakers we have reviewed in the past has relatively neutral (balanced) sound signature. The bass is present and punchy but not too bassy or boomy. If you are into bass-heavy sound, this speaker might not be the best choice. The mids are very detailed and dynamic while all the voices are clear and crisp (slightly pushed forward). Highs are quite clear but can be a little bit harsh at high volumes. The distortion kicks in at 90% volume but it’s barely noticeable. The bass doesn’t affect the mid-range even at full volume. The soundstage is surprisingly wide for the speaker of this size but the stereo separation doesn’t exist. Even if you pair two Aura Studio 2 you won’t get better separation since there is no stereo mode (only dual sound, which means both speakers play the same audio output). There are two more issues we would like to discuss. 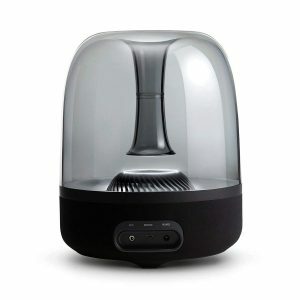 The first issue is related to 360-sound and to the fact that Aura Studio 2 speaker has to be plugged in all the time. Since it has to be plugged in, it has to be near the socket (against the wall) and not in the middle of the room which kind of ruins the whole 360-sound experience. Another thing you should be aware of is that this speaker has one down-firing woofer. When there are down-firing woofers, the sound depends a lot on the surface the speaker is placed on. You should be placing the speaker on some hard and flat surface (like a wooden table). Placing it on some other surfaces (like glass table) will cause some odd vibrations, especially at high volumes and it could ruin your listening experience. Edifier is well known for their affordable and great sounding bookshelf speakers but we have decided to present to you a modern and futuristic 2.1 speaker system called Prisma Encore. It’s slightly cheaper than Aura Studio 2. We can’t really say that it looks better or worse since it’s all the matter of taste. They both have Bluetooth and AUX inputs and they both have to be plugged in all the time. Edifier Prisma Encore is slightly louder but we like more the sound coming from the Aura Studio 2 (more balanced). Still, Edifier’s speaker system sounds really good. Prisma Encore comes with a wireless remote while there’s no remote for Aura Studio 2. Prisma Encore offers much better stereo separation. SoundSticks 2.1 speaker system looks similar to Aura Studio 2 but it doesn’t have the ambient lights which makes Aura Studio 2 so much better. SoundSticks 2.1 is not as loud but delivers better bass response, much better stereo separation, and wider soundstage. They both have Bluetooth and AUX inputs. Just like Aura Studio 2, Soundsticks 2.1 has to be plugged in all the time (no battery). COMISO HomeAudio is, just like Aura Studio 2 very elegant but Aura Studio 2 still looks much better. COMISO is much cheaper than Aura Studio 2 and it’s inferior when it comes to sound quality and loudness. COMISO has a bassy sound signature, while the midrange and voices are not perfectly clear and detailed. On the other hand, COMISO is portable (battery-operated) and delivers up to 12 hours of playtime. You can pair two COMISO speakers together just like you can pair two HK Aura Studio 2 speakers. Aura Studio 2 is a unique, stylish, and great sounding speaker. If you don’t need your speaker to be portable, you will be very happy with Aura Studio 2. It’s on a pricey side but the performance completely justifies the price tag. If you need a wi-fi speaker that looks equally good, you can buy much more expensive Aura or Aura+ speakers. 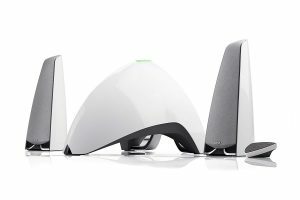 They can be connected to your home wi-fi network, they have built-in AirPlay and come with an app. They look exactly the same as Aura Studio 2. Edifier Prisma Encore also looks very interesting (but completely different from Aura Studio 2) and delivers great sound quality. 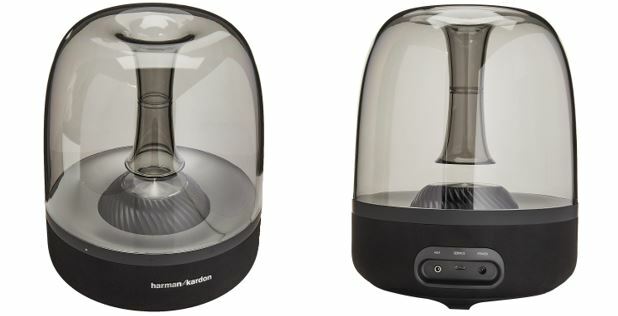 Harman Kardon SoundSticks 2.1 is very similar to Aura Studio 2 and even performs slightly better but it doesn’t look better and doesn’t have all the lights. 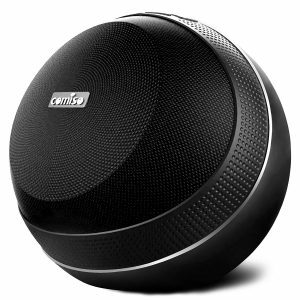 If you need something really elegant but portable and relatively cheap, you might want to check out COMISO HomeAudio.